Get the best Hilo location without paying more. Compare walking out your door to snorkel with turtles to any other house. 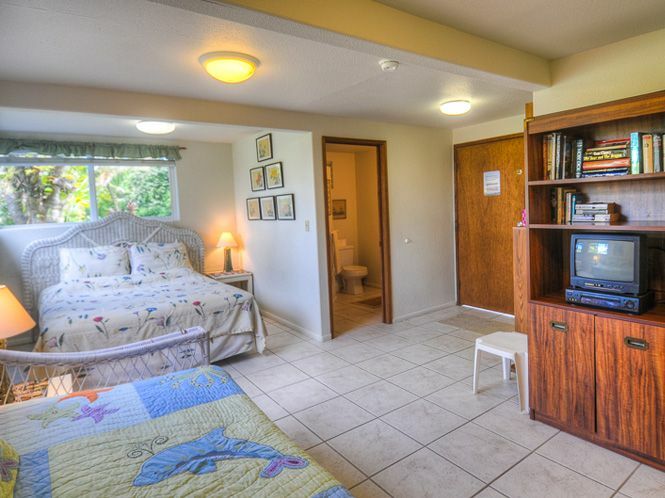 All this and a Hilo location just minutes from Downtown. Stay in a well landscaped home that is maintained to avoid mosquitos. Enjoy almost half an acre across the street from Richardson’s Beach Park. One of the 7 stops of the Hop-on Hop-off bus tours. Take out the kayak and learn to stand up paddle board. Listed on VRBO at #3948514ha. No need to pay a booking fee. NEED MORE SPACE? : Call us and ask about the upscale 3br/2ba beachfront house next door (Beaches house or www.vrbo.com/3948511ha). 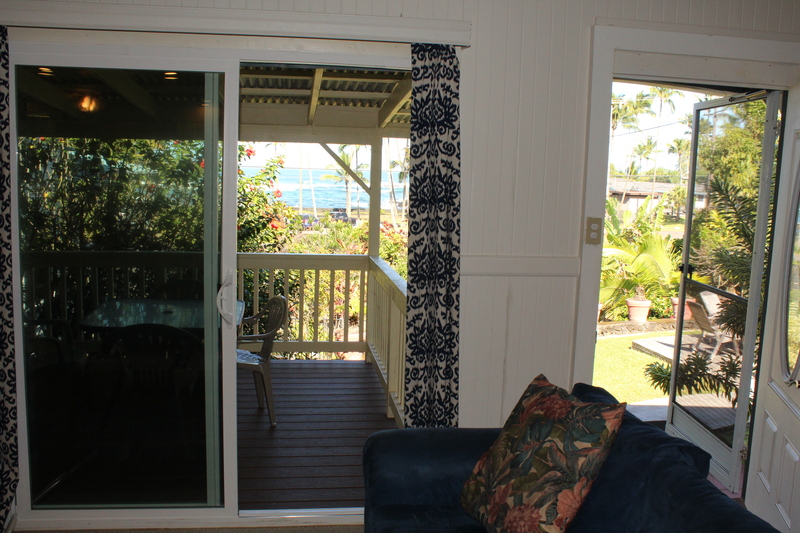 We also have another 3br3ba oceanfront house 5 doors down the street (Lilikoi house or www.vrbo.com/27643). Lastly, we have the newest house just 6 doors down the street (Hibiscus house or www.vrbo.com/4035464. Four bedroom, 3 baths that sleeps up to 15. 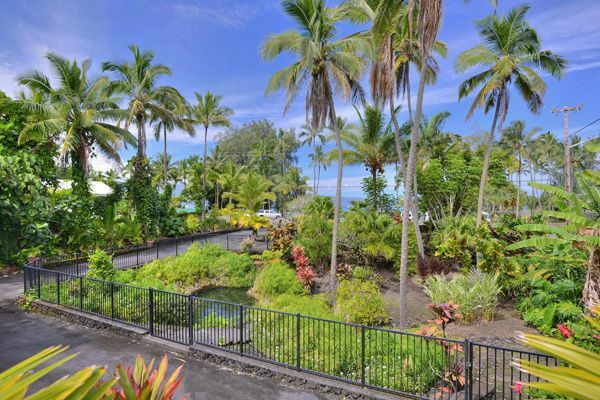 I have 3 other homes just South of Hilo in Paradise Park that are on the water and very affordable. For current rates and availability on all our beachfront houses. PLEASE CALL US at 818 357-6889. Large, 3 bedrooms, 2 baths. 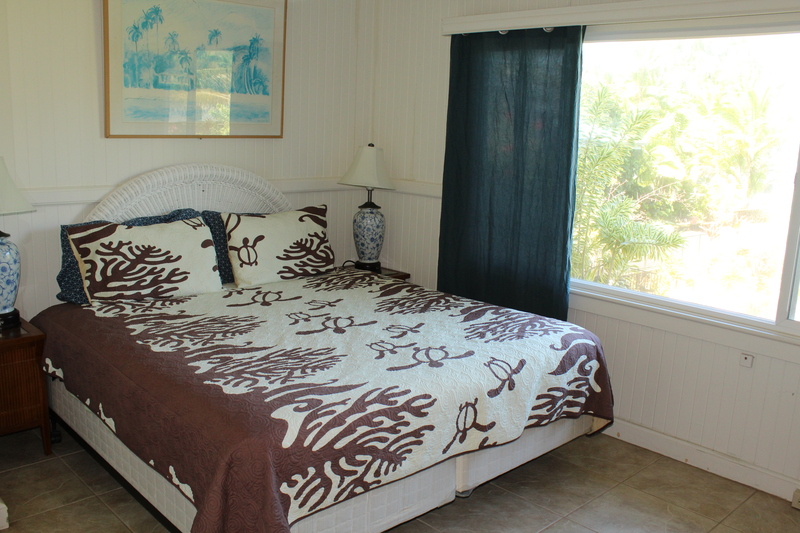 Sleeps 8 with day bed and trundle bed in lower bedroom. Classic Hawaiian architecture with modern conveniences. 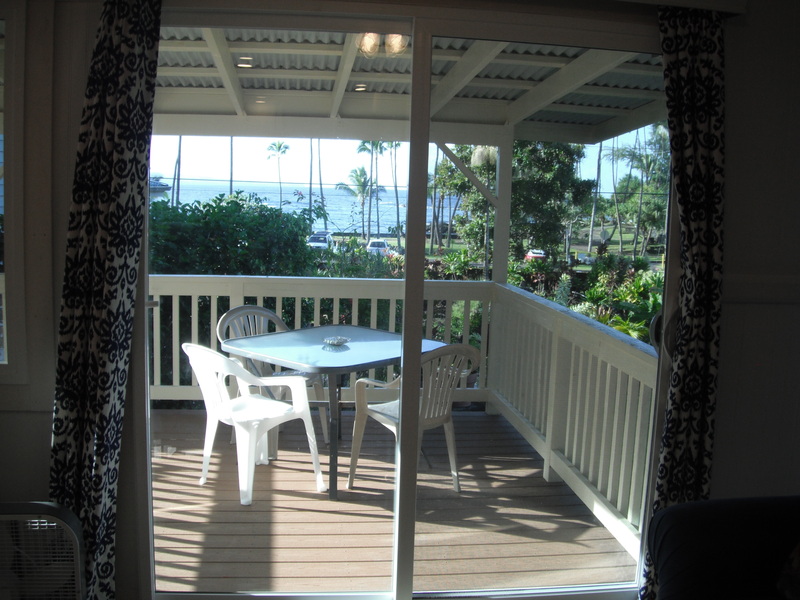 Outside seating on deck overlooking south Hilo bay. Patio with large table and 6 chairs in front. Kitchen – Everything you need. Coffee maker, blender, toaster, rice cooker, pots/pans. Lots of cooking tools. Large oven/range. View of Richardson’s Beach Park across living room out to the ocean. Bedrooms #1 and #2 – Same level as house except for bedroom #3, which is below. Both bedrooms share the main bathroom Ceiling fan. Bedroom #3: Below main house accessed from rear of house by separate outside door. There is no internal staircase. This is a large bedroom with a queen bed, night stand, ceiling fan, quality mattresses and linins. The bedroom also has a daybed with a trundle bed below the daybed. This bedroom has an attached bathroom. 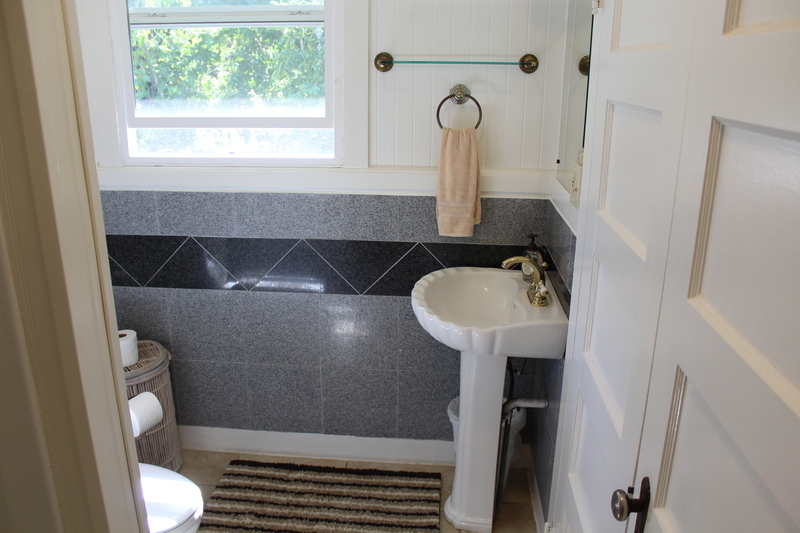 Main Bathroom: Shares the upper floor with the two bedrooms and living area. Bath towels, hand towels and wash cloths, hair dryer, shampoo and soap provided. Shop large stores for all your supplies. Just a quarter mile above the Hilo airport is a Walmart, Target, newer Safeway, mall with modern movie theater and cute stores. Date of stay - October 11, 2016. Copied from VRBO. 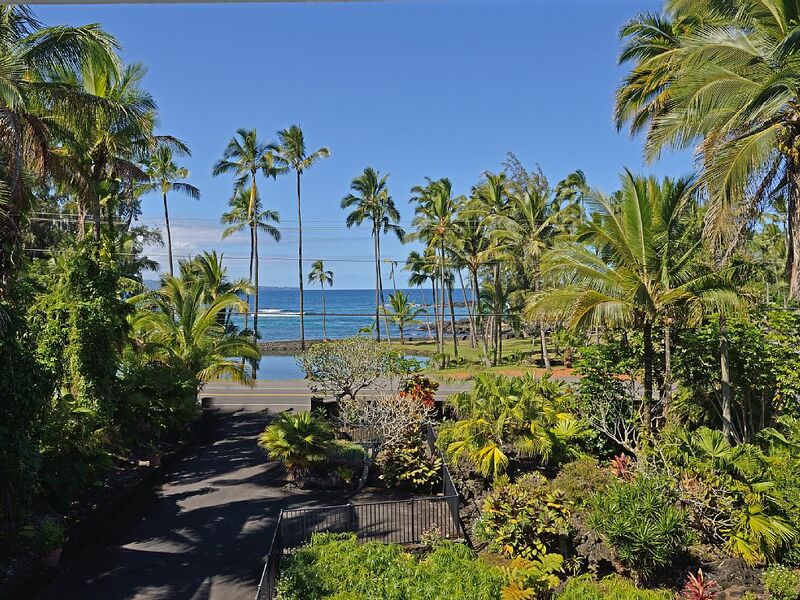 Redrox said: We rented both of Richards Hilo vacation homes for our group of 16 running the Hawaii Ragnar, we couldn't have asked for a better location! The home was perfect for out group and although we were not there much it was great to come back to a nice comfortable bed after a long day of running. The home is directly across the street from a beautiful beach, we enjoyed the turtles and other wildlife along the beach - and of course the sound of the waves as we slept. Richard was more than accommodating while booking the home and left plenty of suggestions for places to eat and things to do, we had to call him a couple of times and he was very nice and helpful. Hilo reminded us of "old" Hawaii, not commercialized and many locals surfing on the beach. 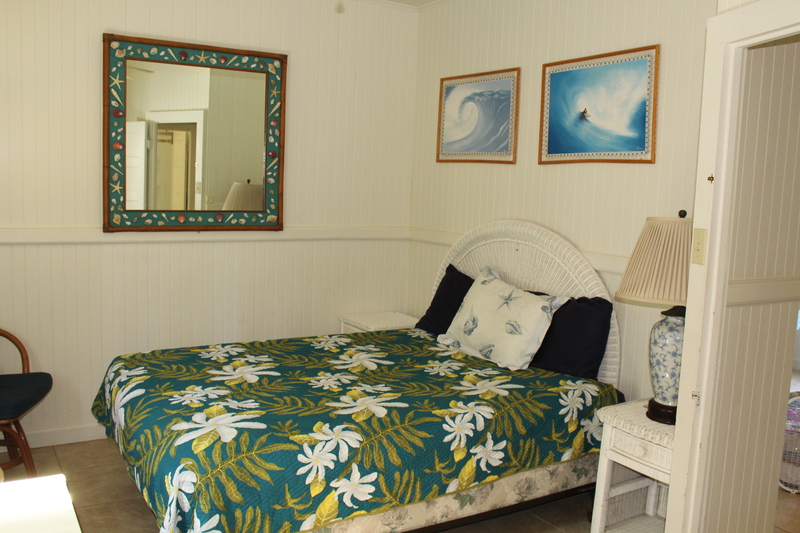 If you are looking to stay in this area of Hawaii, we could highly recommend this home! Date of stay - August 14, 2016. Copied from VRBO. Marnie V. says: This was the second stop on our two week Hawaiian vacation. We flew into Hilo from Maui to explore this side of the big island. 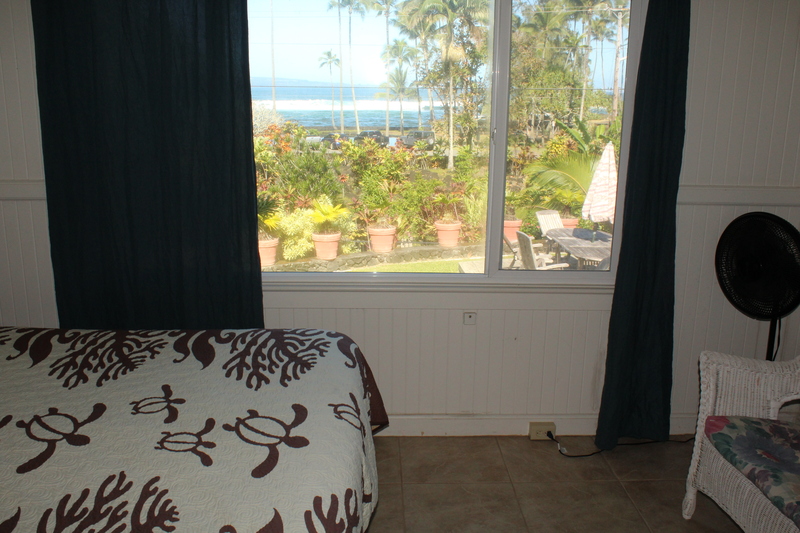 This was a comfortable cottage located right across the street from a black sand beach with great snorkeling. Nice kitchen and living area. Great area close to town but near enough to the volcano that we didn't have to do too much driving. The only odd thing is the 3rd bedroom is accessible from outside. The kids wound bunking on the couch in the main part of the house because they didn't want to be downstairs. Great set up if there were two families traveling together to give some privacy. My Response Thanks for the review. I always remind inquiries of the outside access to the downstairs should they have smaller kids. I always strive for a 5 star review and I don't want guests to not be aware of the lower bedroom access. Date of Stay May 1, 2016 Copied from VRBO: This was our first time in Hilo. The house had everything we needed for the 6 of us. The whole area had such a great vacation feel to it. There is so much to do. We wanted to travel around the Island more, but the kids were having so much fun at the beach park across the street we changed our plans. There are so many fish and we often saw turtles, especially in the evening. The home is comfortable and we had all our meals on the outside deck. I could do some work as needed - great wifi. We all want to come back. Recommended for: Families with Young Children, Sightseeing, Adventure Seekers, Age 55+, Romantic Getaway, Families with Teenagers My Response I'm glad you had a great time. We continue to make improvements to the house with the deck and patio being the latest. We hope to see you back one day. Date of Stay April 20, 2016 Copied from VRBO: We enjoyed listening to the ocean waves, frogs and rain in this well appointed home. Plenty of privacy and yet easy access to downtown cafes and farmers market. Richardson beach across the street is the most popular snorkeling area that would daily surprise you with sea turtles and tropical fish. The basement bedroom was a perfect space for friends and family to have their own privacy with its own entrance. 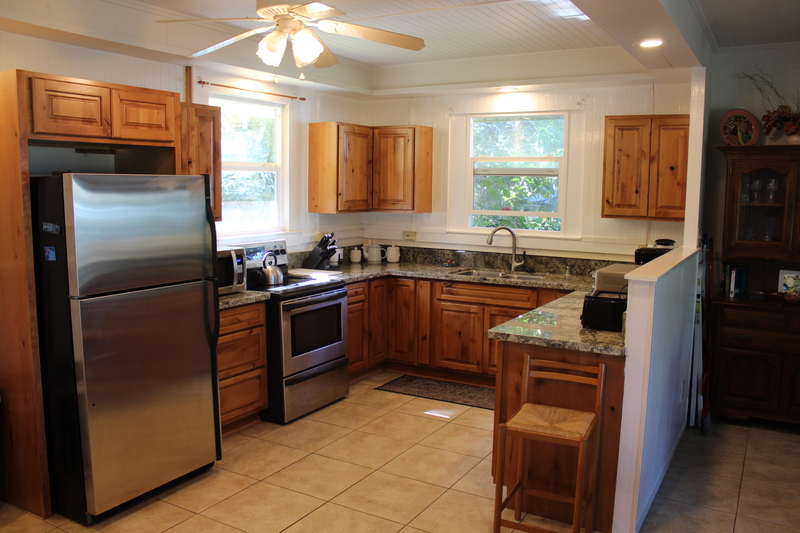 Date of Stay December 27, 2015 Copied from VRBO: The property is conveniently located so that we could go to Richardson's beach and still have quick access to the house. We snorkeled most days and sometimes with the big turtles. They have plenty of gear to use for water activities. I was worried about the rain but it ended up being a non-issue. The owner was great and quick to answer emails. The house was as it was as it was presented on the web site and there were no surprises. I would recommend this house to others. 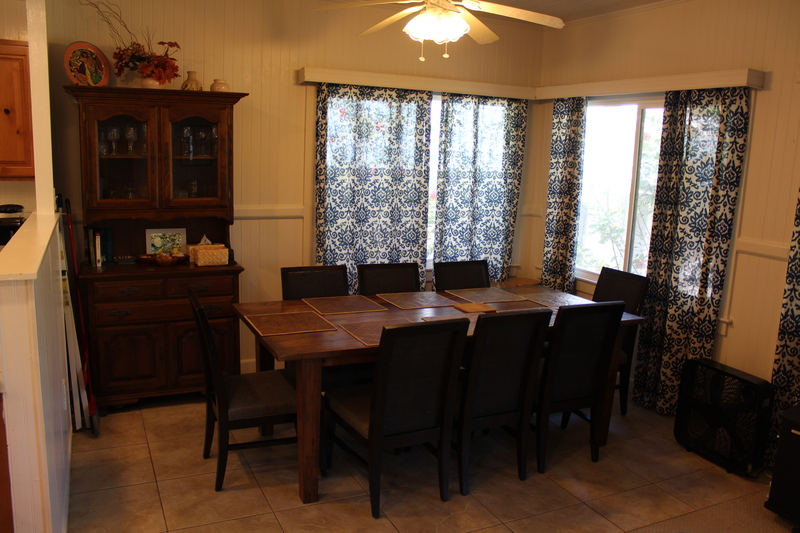 Date of Stay December 20, 2015 Copied from VRBO: We spent Christmas at this rental, visiting our son who lives near Hilo. The kitchen appliances are older, but worked great for cooking dinner for 8 (buy your fish at the local fish market open daily - Suisan). Hilo is not a resort area so you need to keep your expectations in line with that. This home met our expectations based on the listing, and the owner was responsive by text the couple times I needed to contact him. It is located across the street from great snorkeling, protected swimming, and a large group of turtles. We even saw a rare monk seal. It rained every day of our stay, but we were still able to enjoy ourselves. Things smell a bit musty because of the constant dampness. There was a large supply of bath towels (could use more kitchen towels, beach towels, and new kitchen rugs). We used the washer and dryer and even though they looked old, they work just fine. 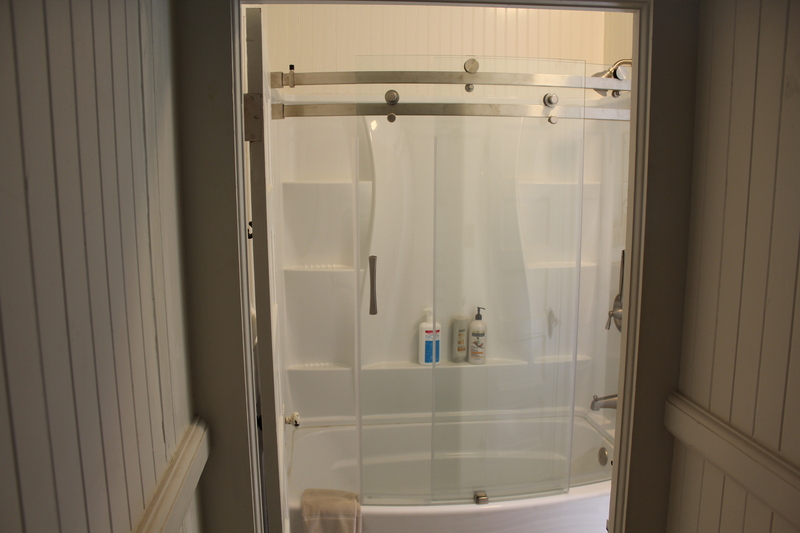 The water pressure and hot water supply is great, but the main shower would not be suited to anyone with mobility or balance issues because you need to climb into a claw foot tub. (The downstairs separate suite has a standard walk in shower.) It's quiet at night, the frogs aren't too loud, and comfortable for sleeping without air conditioning. The sectional sofa is great for family gatherings and looking at the ocean view. It could use a larger kitchen table with more indoor chairs (we just used the plastic outdoor chairs and that worked out.) There were swim shoes in a variety of sizes for walking on the lava - a nice bonus. There is also a nice supply of local guidebooks that helped us find fun hikes and activities during our stay. The wi-fi works great. We never turned on the tv, so I don't know about that. 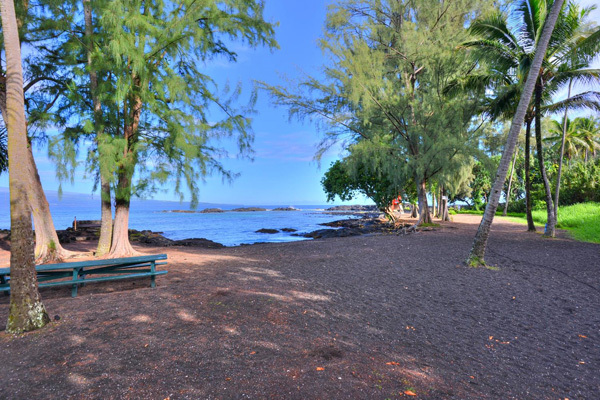 This place is not walking distance to town, but if I had to choose again, I would still prefer this location for the beach access (rare in Hilo) and quiet neighborhood. My Response Thanks for the review. Anything less than 5 stars is disappointing. Oddly enough, right after your check out I delivered a new, 6 person dining room table with chairs. December dampness is an issue and I have a dehumidifier in the lower room to combat this. That is rare for a rental. I'll get more kitchen and beach towels. I can't find anything else that it needs based on the review. 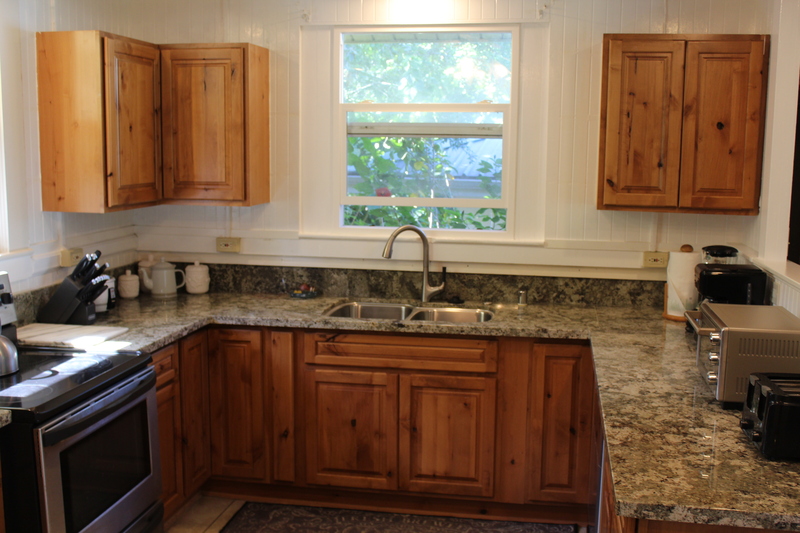 Date of Stay August 18, 2015 Copied from VRBO: The house was spotless and well stocked. The front windows look over the bay and Beach Park. This is truly the islands best place to be. Locals and tourists come to enjoy the area and all we had to do is walk out of our front door. The house has snorkel equipment and boogie boards. It is just up the street from Downtown. We were able to cook, do our laundry and sit on the black sand beach. The fish in the bay are like swimming at a pet store. Amazing. Yes, even turtles. We have been to many Hawaiian towns but this was our first time to Hilo. We will certainly be back. Date of Stay April 18, 2015 Copied from VRBO: Our kids had so much fun here. You couldn't ask for a nicer place. We snorkeled with turtles and saw so many interesting fish. We swam under a waterfall at Boiling Pots. Great restaurants in town. Wine tasting before the Volcano Park is a treat.